Autumn is a magical time for a wedding: the rich golden hues of the trees, falling leaves and the dappled light – it just might be our new favourite wedding season. This is an obvious one: Nothing says Autumn quite like the rich palette of falling leaves. Incorporate golden yellows, amber oranges and burnt reds for a definite Autumnal feel. Berry tones work well, too! 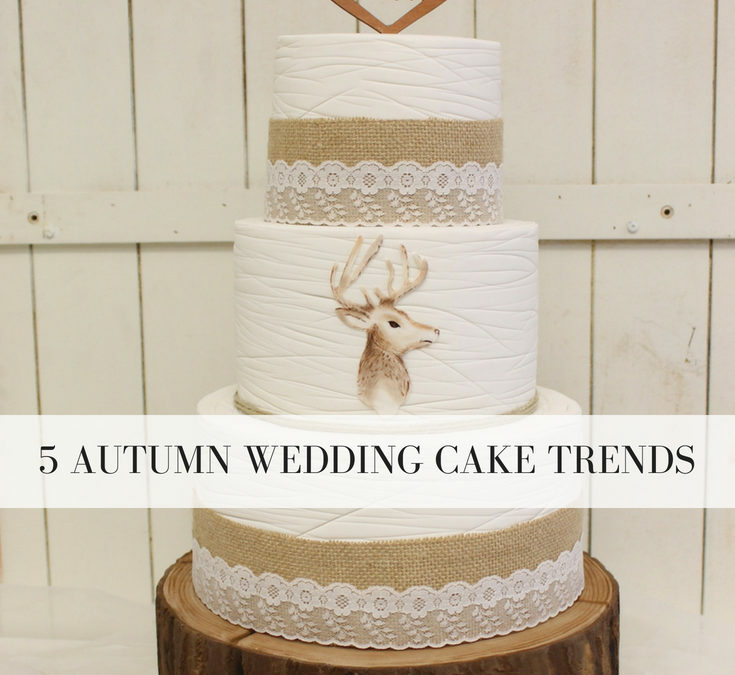 Nature, or forest inspired cake trends have proven to be very popular with Autumn weddings – the wooden tree trunks and the neutral colour palette has got us feeling all kinds of Autumn! A perfect choice for an Autumn wedding. 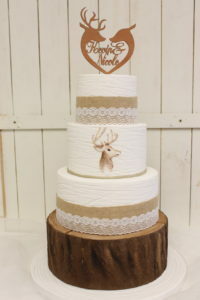 A semi-naked cake is simply a normal cake that allows the cake layers to show through while keeping the sides nice and straight. Not as casual as a naked cake, it still has a rustic feel – especially dressed up with delicious Autumnal blooms or produce – beautiful! The perfect metallic shades for your special Autumn wedding – rose gold especially is a popular choice for an Autumn wedding, bringing out all those berry shades. 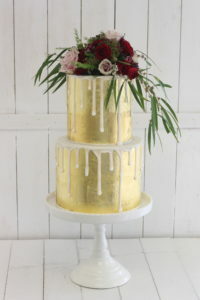 You can incorporate gold or rose gold metallics in so many ways – from foiling, piping, and even icing! 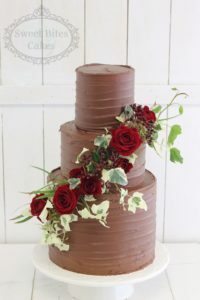 We don’t know if it is the colour, or the comfort of a super rich, gooey, delicious chocolate cake, but there is definitely something about the use of chocolate for a wedding cake that gives us total Autumn vibes. 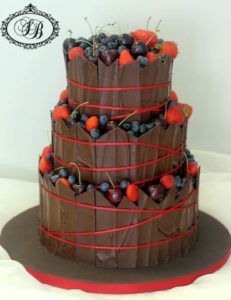 Brown cakes are a gorgeous wedding cake option.. and who doesn’t love a chocolate cake?! Are you sold on an Autumn wedding yet? We are! 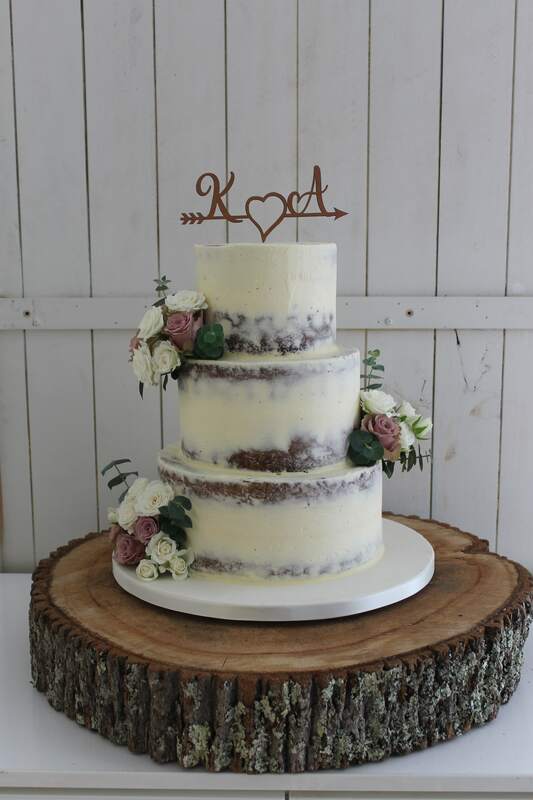 As always, if you would like to book a complimentary wedding cake consultation, give us a call on 09-836-8806, or send us an email at info@sweetbitescakes.co.nz.